Fun and fancy dress encouraged but not required! Sponsored by the Friends of Greenfield Dance. New Year’s Eve, on a night when you probably have many options, you’ll find that the Guiding Star Grange is offering the best of musicians, callers and YOU, our community. It is a special night to come together and dance in the new year with your friends and dance buddies. It’s always a packed house and high energy. Calling for us are GEORGE MARSHALL and DELA MURPHY. DESSERT POTLUCK at the break. As usual, please bring clean smooth-soled shoes to protect our beautiful dance floor. We strive to be scent and substance free. Presented for you by the FRIENDS OF THE GREENFIELD DANCE. It’s our 23rd annual FUNd raising dance, the FALL FROLIC. Brought to you by the Friends of the Greenfield Dance and including 8 hours of great music, friends, contra dancing and waltzing. OR Join or renew your Friends of the Greenfield Dance membership for $25 (or more) and get in free! Topics will depend on the interests of the students, but could include flourishes into and out of swings, chains, roll-aways, and more! Teaching by Ryan Carollo and Ashley Tardif will emphasize consent and include techniques to decline flourishes. This workshop is open to all, but will target intermediate and experienced dancers. Stay tuned for more details on how you can help. All are welcome to join us for the Annual Meeting to learn more about Friends’ activities. A blue moon and Greenfield’s 6th annual contra prom, what could be better? The Cosmic Otters make people dance. Starting with a solid rhythmic foundation of guitar and piano, they add inventive twin fiddle harmonies, and finish with juicy, pulsing accordion playing and tasteful percussion. 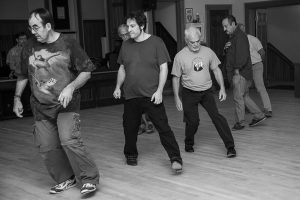 Their tunes are from the British Isles and its relatives – Ireland, England and Scotland with side trips to Cape Breton and Quebec – but definitely their own, with an unshakable drive and playful improvisations that make dancers smile. For more info, email us. New to Hambo? This event is designed for you. Already know how to Hambo? Great! Experienced dancers are encouraged to come as ringers. Looking to make a night of it? Why not get some dinner in Greenfield after the workshop and come back for the Moving Violations contra dance! That feeling of spinning, counter-balancing with your partner, at times almost airborn – it just can’t be beat! It is no wonder that the Hambo is one of the most widely performed dances of Sweden and has long been popular among folk dancers of many nationalities. The Hambo contains two parts – moving forward side by side, inner hands joined, and a closed turn which is a little “tricky” in that the partners execute different, interlocking steps. Apart from numerous historical versions, differences also exist in versions danced widely today–for example, the version danced in the Swedish Hälsingehambo competition tends to be slow and elegant with a relatively strong svikt (dip and lift) while that danced in American contradance venues is much faster with little svikt. Challenging? Yes! But once mastered, it’s a joy that lasts a life time! Live music for the workshop will be provided by Van Kaynor! After the Hambo workshop go have a leisurely dinner then come back and dance to The Moving Violations. At the break they will be playing Hambo tunes so that you can enjoy your new skills. Who Are Jen and Laine? 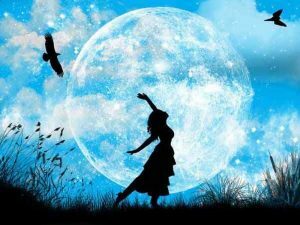 Jennifer Brosious and Laine Harris first met as a “tour romance” through a professional folk dance troupe, the AMAN International Folk Ensemble, in Southern California many, many moons ago. For decades they immersed themselves in Scandinavian dance culture, in particular the dances of Sweden & Norway. Taking advantage of numerous opportunities to study with master teachers and tradition bearers, they attended week-long dance camps on both the East & West Coast of the United States as well as traveling for workshops abroad. One Summer, Jennifer had the opportunity to participate in the Hälsingehambo competition in Sweden with a Norwegian partner, who also happened to be King’s Medal Winner. Competing with 1500 couples, they were among the few honored with a prize for their dancing. 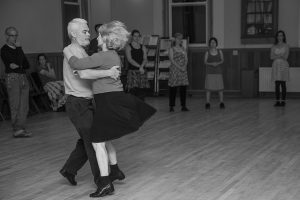 Closer to home, Laine and Jennifer have taught Scandinavian dances, and the Hambo in particular, throughout New England, including 9 years running at the Dance Flurry held annually in Saratoga Springs. They are fluid dancers and experienced teachers with a light-hearted sense of humor —you’re sure to enjoy learning from them! Larry Unger has played guitar, banjo, and bass with many top bands for contra dances including Notorious, Reckless Abandon, Uncle Gizmo, Big Table, and the Reckless Ramblers. He has also accompanied such fiddlers as Elke Baker, Rodney Miller, Alisdair Fraser, Matt Glaser, Ralph Blizard, and Lissa Schneckenburger to name a few. The bands Larry has been a part of might vary in style from Oldtime to New England to Celtic, but they are all lively groups with exciting rhythms and an emphasis on fun. These bands also play some of Larry’s many original tunes. A talented, multi-instrumentalist and singer, George Wilson’s repertoire samples a wide variety of traditional and folk styles. As a fiddler, he plays over 500 tunes for dancing and listening — tunes from New England, Quebec, Cape Breton, Scotland, Ireland and Shetland. His dynamic fiddling, strongly influenced by Cape Breton and French Canadian styles, has been popular with contra dancers and concert-goers since the late 1970s. George Marshall is a full-time musician, caller and dance teacher, touring nationally year-round. His specialty is teaching and calling the New England-style contra dances he has collected throughout the country. George is renowned for his knack of matching music to dance and for his smooth, concise teaching and presentation.